Gun battle shakes Kabul airport Jump to media player Afghan security forces have tackled heavily-armed militants who seized a building near the main airport in the capital Kabul. Blasts heard near Kabul airport Jump to media player Suspected militants have launched an attack close to the main airport in the Afghan capital, Kabul. 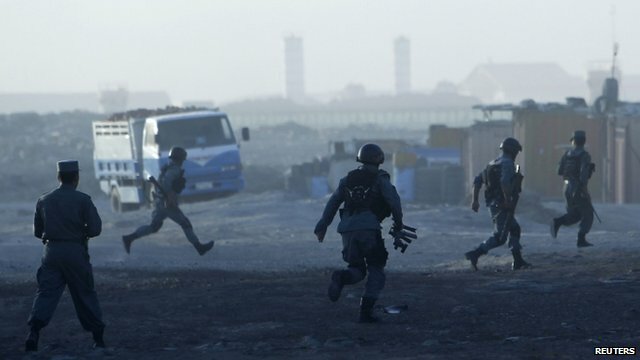 Afghan security forces have tackled heavily-armed militants who seized a building near the main airport in the capital Kabul. Officials said seven gunmen had been killed in the five-storey building under construction near the airport and the attack was now over. The Taliban earlier said that they carried out the assault. David Loyn reports from Kabul.